This Slimline concealed toilet cistern is an ideal choice for for space saving within a bathroom and is designed for back to wall toilets. 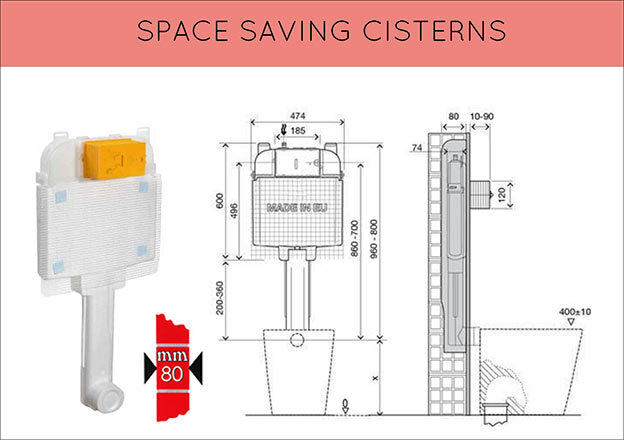 This hidden in-wall cistern is only 80mm in thickness and will easily fit within the void of timber walls or fitted in front of a masonary walls and only reducing the space by 80mm. Each slim cistern can be supplied with a choice of 24 high quality flush buttons. * For back to wall toilets. * Slimline cistern at only 80mm. * 24 cistern flush plates. * Easy maintenace through button.